Killarney is often cited as one of the as one of the top tourist destinations in the world. It is hard not to see why as the town is set in the heart of 26,000 acres of natural parkland, mountains and three stunning lakes. It is the gateway to the Ring of Kerry, one of Ireland’s most popular driving routes, and there is plenty to see and do. It is also a fantastic place for families to visit and there are no shortage of family things to do in Killarney. When it comes to whole family options, Killarney has some great activities to explore such as a pitch and putt course, a waterbus to take a trip out onto the lakes and lots of horse-riding options, including riding through the national park. All of these are great activities to keep both younger and older family members engaged. For young kids specifically, Killarney is home to pet farms with play areas, a traditional farm on the grounds of Muckross House and a wildlife sanctuary with exotic animals and birds. If there are teenagers to cater for; there is a cinema in the centre of the town and plenty of shopping options. For the more active teen or adult, high ropes and paintballing are also great things to try out. For more details on Family Things to Do in the Killarney area, have a look at this handy guide produced by The Dunloe Hotel which is summarised in the image below. You can find out about some more great activities for all the family in the Things to Do section of Killarney Guide. 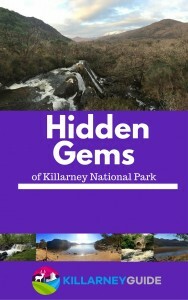 If you’ve enjoyed reading this post, please subscribe below to get a FREE eBook on Killarney National Park.